The OrionLX can serve as a cost-effective HMI in the electric utility substation. Selected data from substation meters, event recorders, relays and other IEDs are accessed and used to animate HMI webpages. These pages are viewed with an on-board, open-source Midori browser, and exported through a VGA port to a local touchscreen HMI. 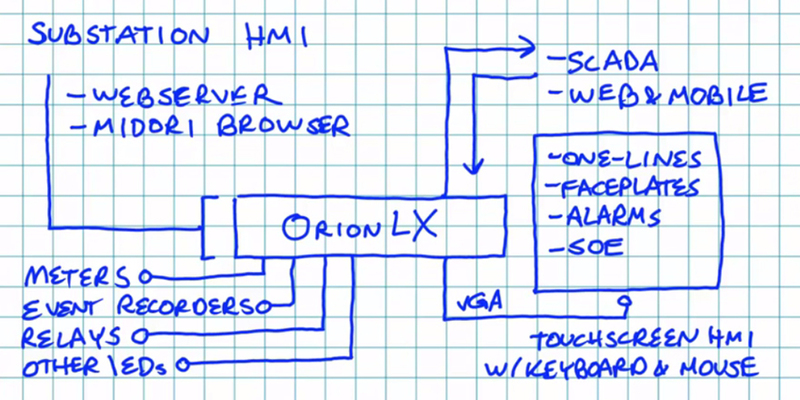 Keyboard and mouse are connected to USB ports on the OrionLX. This eliminates the need for a substation PC, along with its cyber security and software update challenges. Users can use a standard library of single-line diagrams, faceplates, alarm, and sequence of events pages, and can create custom SVG screens with the open source graphics tool Inkscape. All screens visible on the local substation HMI are also browsable by remote SCADA and mobile clients, providing a low-cost, secure, and flexible substation HMI solution. Open object-relational database management system (ORDBMS) used in the OrionLX to store SOE points, Alarms, Tags, and files in non-volatile Expanded Memory. Stores both discrete and analog events based on time (e.g. every 15 minutes) or change (e.g. ON-OFF or analog change out of deadband). Alarm Annunciation functionality includes defining alarm states, defining alarm messages. Pre-engineered “Archive” and “Alarm” webpages included. Enables ASCII data from SEL® or Alstom Optimho relays to be viewed in webpages served out from the OrionLX. Includes XML protocol to transfer data into custom webpages. Also include Inkscape plug-ins to simplify point selection and for graphics libraries. Board with VGA Video Port, 3rd Ethernet Port, Audio Port and two USB Ports for keyboard and mouse (requires HP CPU).